The FreeGo Wren electric bike is a small framed step-through version of the popular Hawk. As well as being suitable for persons under 5′ 10″, it is very easy to park and store. The FreeGo Wren electric bike combines all the high specification of the FreeGo Hawk, but for the smaller cyclist. With a 17″ frame and 24″ wheels the FreeGo Wren is ideal for those people from 4ft – 10″ through to 5ft – 6″. However, with its quick-adjust saddle the Wren is also an ideal bike for sharing among the whole family as it will carry passengers of almost any height. The FreeGo Wren comes complete with LED front and rear lights, mudguards, chain guard, rear carrier and an integral rear wheel lock for added security. A powerful 36V lithium battery offers a range of about 30 miles, depending on riding style and conditions. The brushless rear wheel motor, like all FreeGo electric bikes, is protected against burnout. You can never overheat the motor going up a long steep hill as it has an automatic cutout which allows the motor to cool down before you ‘restart your ascent’! FreeGo offer one of the best warranties in the industry with a 4 year guarantee on the Wren’s robust aluminium frame, and a full 2 year guarantee on the battery. The electrics and motor are warrantied against defects for 1 year. 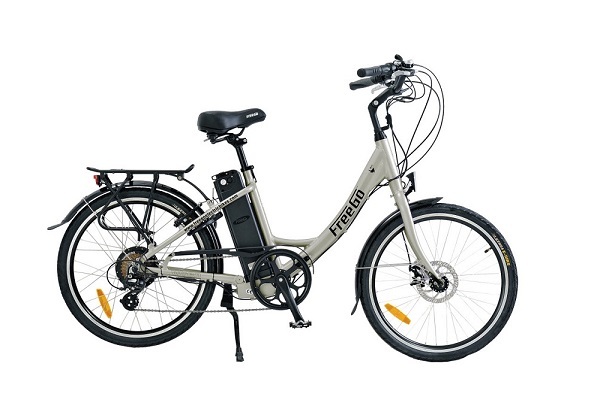 The smaller frame size of the FreeGo Wren electric bike also makes it ideal for parking; whether in the garage, hallway at home, or in the corner of the office. Who is the FreeGo Wren suitable for? 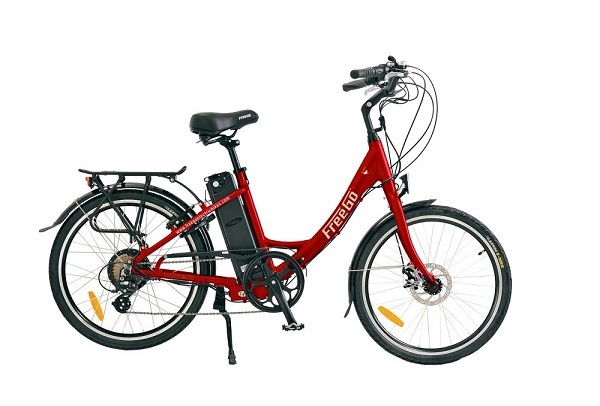 Whether you intend using the FreeGo Wren for commuting on the city streets or simply taking a ride to the park or countryside the FreeGo Wren will make your day a pleasure. It is robust but good looking, which means it should last for years and years. The smaller frame size makes it ideal for shorter cyclists, but that does not exclude taller riders, and it is especially suitable as a ‘shared’ bike which can be used by the whole family. Available in Lilac, Black and Diamond White. Come and take a free test ride at Ebike Centres in Leicester. LED front and rear lights, with rear brake light. Runs off main battery. Lockable Lithium-ion 36v battery. Choice of 10 Ah (standard) or 16 Ah (super range). Can be charged on or off bike.